So this is to be a multifaceted post. As you can see, this is my first post in some time. In fact, it looks like I left the Phil & Sebastian Zelaya post up in the air… there is no conclusive remarks, parameters or grades. Why you ask? Well the coffee has run-out at the roaster! Why then, write a detailed review on a coffee that technically no longer exists? So, we have reached a problem then. Or- at least I’ve hit a personally challenging issue. I mean, think about it… Yes, there may in fact be a similar coffee next season, BUT it will never be the same coffee. So now my pending review is stagnant, stuck in time… Even if a reader were interested, they are completely unable to participate and can not get that bag of that coffee. Which leads my to the next issue: if the point of my writings is to put coffees under the magnifying glass for the practicality of the reader, then what is less practical then a review on a coffee that is out of your reach? So, I’m asking for your help. Do you want the review anyway? Or do you want to see me acting sooner and working faster on coffees as they are coming out? 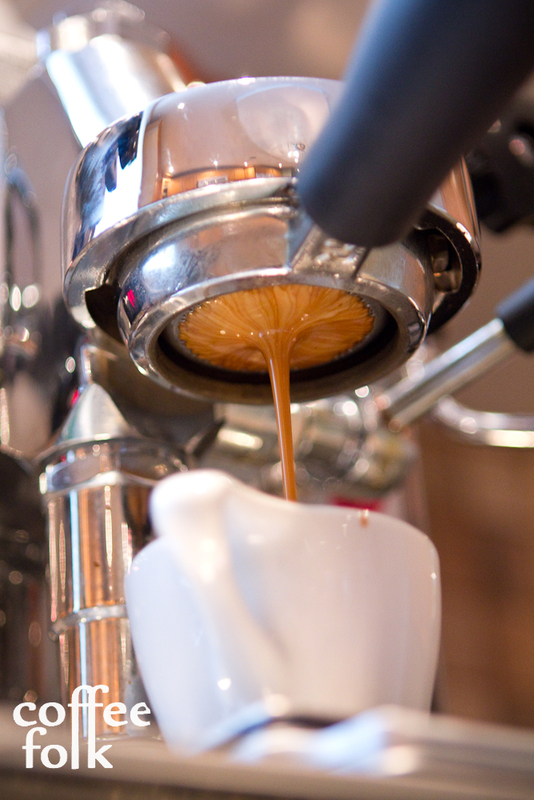 Is it worthwhile to act early and ask roasters for new coffees to ‘test out’? Which brings me to my final point for this post. What belongs on a bag of coffee or espresso? I’ve been thinking about this idea of ‘what belongs on a bag of coffee’ for some time now, and two Roasters have caught my eye. The problem though, is that this in itself is a very complex and tricky post – perhaps one I will have to expand on at a later date. However, there is one point I’d like to touch on here. I’ve been working on some coffees from Square Mile (yes, the one that the super star James Hoffmann is associated with – Mister JIMSEVEN himself). What is interesting, is their breakdown of their espresso blend “Red Brick”. Firstly, current trends all point to increased transparency in the coffee/ producer relationship (this is certainly not new). However, Square Mile pushes further, offering transparency in newer territory. Let’s look at the ‘espresso blend’, something that was once a covenant entity, one that was held tightly by the roaster and sworn to secrecy. Now, I’m not saying Square Mile was the first to free the details on their espresso blend (49th Parallel’s Epic also comes to mind off the top of my head)… however, they do offer a new and clear version of this idea directly on the bag. 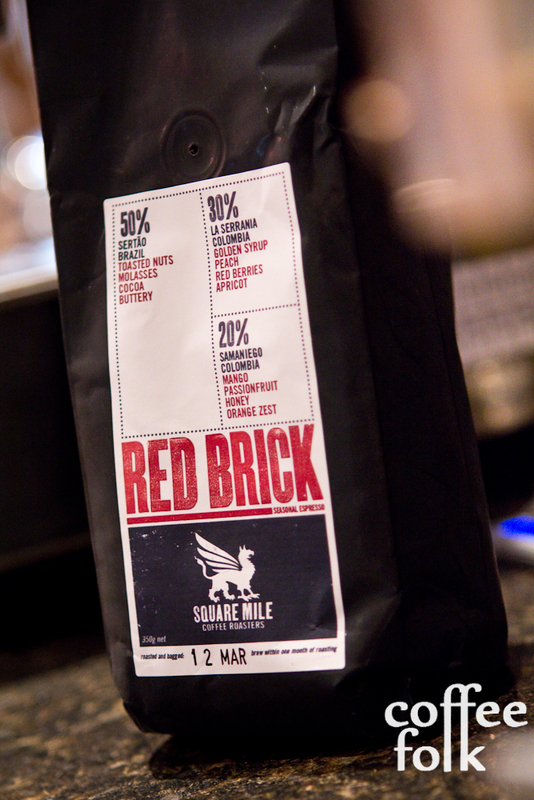 Red Brick is clear, and concise: take a look at the photo [Square Mile: “Red Brick” bag detail]. So, there are two things here: the general (which consistently each shot was very good) and the minuet (where we hit other, or all? aspects of the blend). Interesting… I’d love to hear others thoughts here. This was certainly an epiphany moment for me… it’s one of those things I’ve thought about for a long time but never had it work this clearly in praxis. Thanks to James to recommending some coffees, easily accessible through twitter.